This is a rather special course! Design a sustainable life for you, your family and your community with our urban permaculture design course in central London. 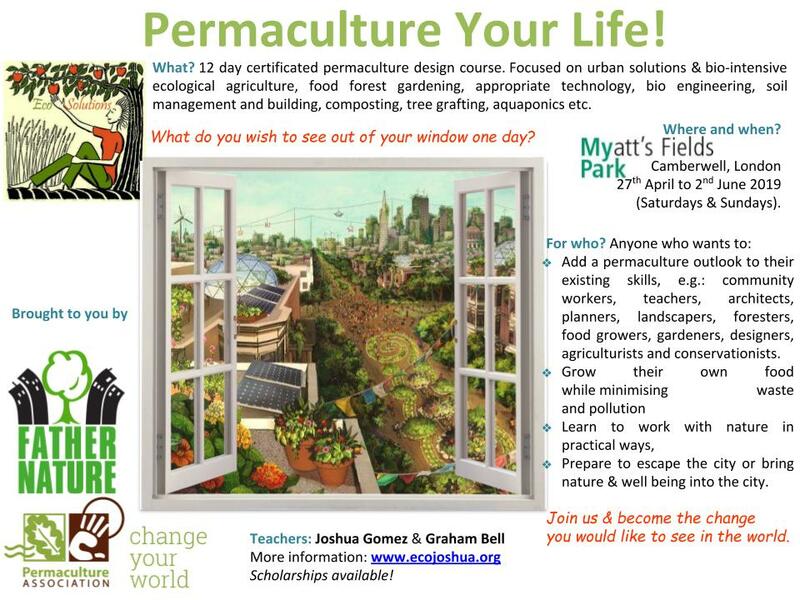 With the collaboration of Eco Solutions and Father Nature, we are very pleased to announce this 12 day Pdc (permaculture design certificate) course, with lead teacher Joshua Gomez and special guest teacher Graham Bell. We will be delving deep into all aspects of permaculture, while giving special focus to finding urban solutions and giving each participant the opportunity to design for themselves a regeneratively greener and more ecologically and economically abundant future. Running both Saturdays and Sundays every weekend from the 27th of April till the 2nd of June at Myatt's field park. The course involves 12 teaching days plus added optional practical days for people who want to come along during any of the week days and get your hands dirty and as we learn through the practical effort of establishing community demonstration gardens. This course will be modular, so people that don't necessarily want to do the full PDC, are still welcome to come along for a day or weekend. Why is the price on a sliding scale? To Put both the ethics of fair share and people care into practice, we have made this course's vital knowledge and learning accessible to all by making it on a sliding scale. Making it equitable, means that those of you who can afford to pay a little more are actually making this course available for those of a lesser income. We greatly appreciate your contribution and all excess proceeds that do not cover both venue and teaching costs from this course will go into a fund for further subsidizing low income participants on other courses and into the future development of community garden projects. If you can't afford any of these don't let that stop your learning, come and volunteer to get your hands dirty at one of our mid week dig-ins and learn about urban permaculture the practical way. Email us to fine out more. If you have any questions or want book a place: Please contact us at ecojoshuatree@gmail.com or just fill out the registration form below and we will get back to you asap. To read more about the instructor Joshua Gomez please see the About page. This 6 weekend, 12 day course will incorporate a full permaculture design course, whilst enabling individuals to learn the skill necessary to start your own ecological enterprise or green business, or just make greater uses of your green spaces and minimise you ecological footprint. Throughout the course we will also be designing and implementing a community garden space on weekdays. It is open to all people and often attended by those in transition to a new life. It provides all the relevant knowledge and experience for anyone wanting to be a Permaculture designer or simply wanting to step further into Permaculture in their own lives. Is it required to have previous experience? No, an openness and willingness to share and learn is far more important. Which types of teaching will be used? Basic list of Courses content can be found on this page. As well as the topics listed above we include a range of other relevant subjects and practical exercises which aim to give each student a tool kit of basic skills to get started with confidence. For example, this course will also provide opportunities for students to learn more about topics such as gorilla gardening, eco building and community living etc. Extra optional weekday practical sessions that we will cover in this course will be Grafting, Pruning, and much more. What are the daily start and finish times of the course?